For all the cat lovers out there, Chewy is your one-stop shop for all the cat supplies you need. Check out our huge selection of cat food, cat toys and cat treats. 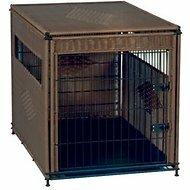 If you've been searching for brown cat crates, look no further. Among the wide selection we carry, one option to try is Merry Products. Key benefit: in kennel mode, it provides a safe and secure place for your pal to lounge in anytime. 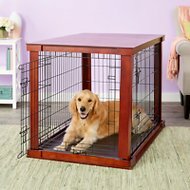 Another product is Merry Products Room with a View Wood Dog and Cat House. Key benefit: easy to clean with removable roof top and bottom panels and easy to assemble with included hardware and instructions. 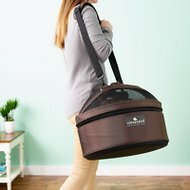 Chewy makes it easy to get everything you need for your four-legged family. From cat trees to cat toys, the only thing your cat will love more than his Chewy box is what's inside! 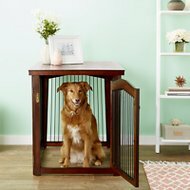 For all your pet needs including brown cat crates, Chewy has you covered! We're here for you.